The peaceful ambience of the Sistine Chapel in Vatican City changed to a cacophony of baby wails and sounds on Sunday when Pope Francis baptized more than thirty infants as their beaming parent looked on. 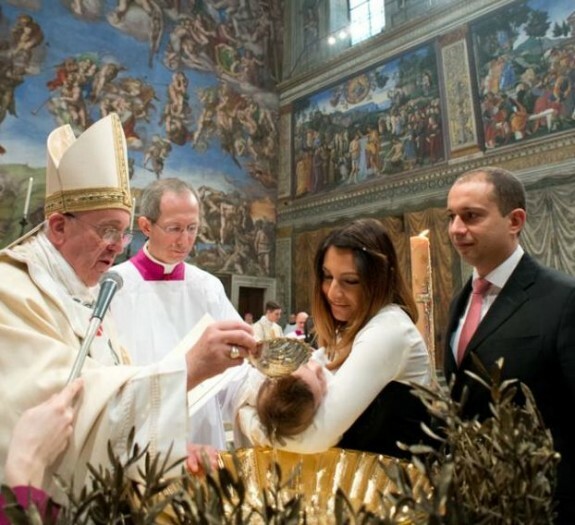 It was a day to remember for 35 sets of parents as the Pope of the Catholic Church baptized their children by pouring water from a shell-shaped dish over the heads of the babies and pronouncing their names one by one. Dressed in white satin or white gowns, the babies were held in their mother’s arm as the ceremony was performed in the renowned Sistine Chapel. In March last year, it was the same Chapel where the cheerful and warm Pope Francis was elected as the first Latin American pope. It might have also been his visible affection for people that may have prompted two of the baptized babies to be named Francescas by their parents. Since taking up his place as the head of the Roman Catholic Church, Pope Francis has consistently tried to make the church more relevant in today’s world doing away with much of the pomp and stiffness associated with the papal appearance. And while he is often seen interacting with the general, it is his ongoing support of breastfeeding moms that impresses us. “Some will cry because they are not comfortable or because they are hungry. A few weeks back in an interview with the Italian newspaper La Stampa the pope had talked of a young mother who attended his weekly Papal General Audience. He said he saw the woman’s baby was crying and so he had urged her to feed him. “She was shy and didn’t want to breastfeed in public, while the Pope was passing. I wish to say the same to humanity: give people something to eat!” Pope Francis said later. The Pope told the parents that the most beautiful inheritance they could give their children was faith.